"Philokalia" means "love of the beautiful and good". It was the name given to a celebrated 18th-century collection of Greek mystical texts on the Christian spiritual life, teaching the path to true sobriety and the fullness of union with God. This "Little Russian Philokalia" is a new collection of ascetic texts drawn from Russian sources, chiefly of the 18th through the 20th centuries. 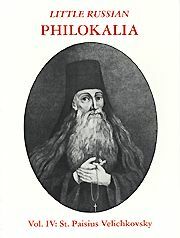 The fourth volume is devoted to St. Paisius Velichkovsky (1722-1794), the Russian-Romanian Elder who rediscovered and made available the ancient texts of the original "Philokalia". On Mount Athos, Greece, and in Romania, St. Paisius was a guide to thousands of monks, introducing them to forgotten teachings on the life of prayer and inward perfection. Cultivating the seeds of wisdom and disseminating them through the books published by his monastery, he revitalized the piety of Romania and, through his disciples, produced a great blossoming of sanctity in 19th-century Russia. His "Philokalic" legacy was brought to America in 1794, the year of his repose, by St. Herman of Alaska and the monks of the northern Russian monastery of Valaam. Here, for the first time in English, are compiled in one volume the spiritual writings of St. Paisius himself: "The Scroll", "Field Flowers", and others. These writings, like the more ancient writings which he rediscovered, connect modern man with the tried-and-tested path of ascent to God, paved by our God-illuminated forebears of long ago. Softbound. 151 pp.